Malaga, Spain, Oct 04, 2018 -- BikeSquare, the Italian startup for electric bike tours, is expanding to Spain to offer the chance of visiting and discovering by e-bike the most important Spanish cities with their different territories, history, and nature. The province of Malaga is rich of beaches where enjoying the sun, but also of inland naturale spaces with beautiful landscape and white villages where reconnecting with the nature. This is why BikeSquare, in collaboration with its partner, QQBikes, specialized also in mountain electric bikes, is offering the chance of an excursion of the Sierra de Torremolinos mountains, with their amazing viewpoints, just a few minutes from the centre of Torremolinos. Thanks to the powerful Moustache electric bikes, ideal for climbing the mountain without effort, this excursion will bring visitors to ​ La Cañada del Lobo (Wolf’s Ravine)​, a stunning place in the heart of Sierra de Torremolinos. A delightful natural environment surrounded by a dense pine forest, to climb through until reaching viewpoints, which offer some of the best panoramic views of the Costa del Sol. 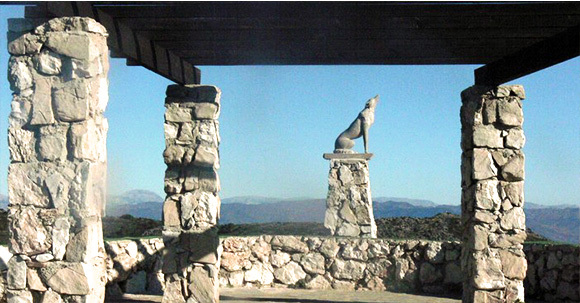 One viewpoint features a sculpture of a howling wolf​, overlooking the mountains of Benalmadena and Alhaurin de la Torre, from which you can see the African continent, when weather conditions permit it. The visitors, driven by an expert guide, once reached the Viewpoint of the Wolf’s Ravine with its amazing views, will have the chance to make the most spectacular snapshots of the place. An unforgettable experience for lovers of travel and bikes! For more information, please visit ​ BikeSquare Malaga​. For other ebike tours and ebike rentals, please check​ BikeSquare Malaga Easy Rent​​ or download the free APP.